The researchers—from Dartmouth, Keith Carlson, a computer science Ph.D. candidate, and Daniel Rockmore, a professor of computer science and mathematics; and from Virginia, Michael Livermore, an associate law professor—studied the frequency of use of “content-free” words, which are also known as function words. The words reveal “stylistic fingerprints” that are “the foundation for the large-scale study of literary style,” the scholars write. And “modern justices’ opinions are written at a lower grade level than the opinions of their predecessors,” the scholars found. Perhaps looking for a silver lining, the researchers concluded that contemporary Supreme Court opinions are “easier to understand than their predecessors.” So that’s something. Based on a formula involving percentages of negative words (“two-faced,” “problematic”) and positive words (“adventurous,” “pre-eminent”), the authors assembled a master ranking of 107 justices, through 2008, by “friendliness score.” The high court’s first chief justice, John Jay, ranks No. 1 with a score of 1.55 percent. Dead last is Thomas Johnson, a rarely remembered associate justice in the early 1790s who racked up a -2.24 percent friendliness rating. Illustrating the trend toward grumpiness, Nos. 103 through 106 are current members of the court—in ascending order of dyspepsia, Anthony Kennedy, Clarence Thomas, Stephen Breyer, and Samuel Alito. Antonin Scalia, who has a reputation for sharp words, ranks at a slightly less grumpy No. 98, with a score of -0.69 percent. 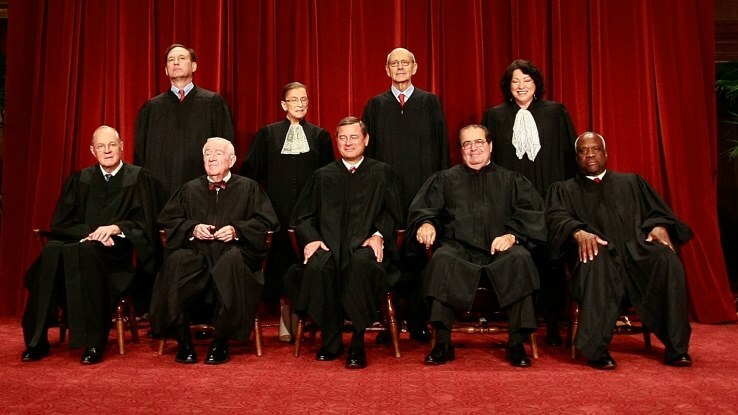 “It would take about 12 years of full-time labor reading one opinion per hour to work through the entire body of Supreme Court decisions, a task that could be held to be ‘cruel and unusual ’ under the Eighth Amendment if assigned as punishment,” co-author Livermore of UVA said in a statement accompanying an advance copy of the law review article. “Advances in mathematics and computer science allow us to approach these massive textual datasets and perceive patterns that no human could, or would want to, find on their own.” Thus knowledge marches ahead.